On 22 December the 10km Int'l de Errachidia (more) was run in Morocco. On 15 December the Fubon Taipei Int'l Marathon (more) took place in Chinese Taipei. The Vadodara Half Marathon (more) was held in India and the Airtel Delhi Half Marathon (more) in the nation's capital attracted such a stellar field that a world record was possible. Among the men were four sub-59 minute performers - including world leader Geoffrey Kipsang, while the women's field includes four who have run sub-67 minutes - including world leader Lucy Kabuu. The Sfax Int'l Marathon (more) of the Olive Trees was run in Tunisia and the St Croix Int'l Marathon (more) in the US Virgin Islands. On 6 December the Ayla Red Sea Half Marathon (more) was run in the Jordanian city of Aquaba. On 7 December the Reggae Marathon (more) was held in Jamaica. 8 December started with the Nara Marathon (more) in Japan, the Milo Marathon Manila Finals (more) in the Philippines and the Tsengwen Reservoir Marathon in Chinese Taipei. In Europe two races took place on the Iberian Peninsula: the Maraton Cabberty Ciudad de Malaga (more) and the Discoveries Half Marathon (more) in the Portuguese capital, Lisbon. The Run Barbados Half Marathon (more) completed the weekend's race programme in the Caribbean island and the Powerade Monterrey Marathon (more) takes place in Mexico. On 1 December the 67th Fukuoka Int'l Open Marathon Championship (more) was held in Japan and the Shanghai International Marathon (more) in China's commercial capital, followed by the Macau Galaxy Entertainment Int'l Marathon (more), the Standard Chartered Singapore Marathon (more), and the Angkor Wat Int'l Half Marathon (more) in Cambodia. The Hyderabad Heritage Marathon and the Pune Int'l Marathon (more) were run in India. On 24 November the Mount Fuji Marathon (more) was run in Japan and the Unicef Charity Run Half Marathon (more) in Hong Kong. The Deccan Chronicle Hyderabad 10km (more) took place in India and Africa's largest road race, the Commercial Bank of Ethiopia Great Ethiopian Run (more) sees 37,000 runners on the streets of Addis Ababa. In Europe the 30th Firenze Marathon (more) was held in Italy, the 23rd Serge Vigot La Rochelle Int'l Marathon (more) in France and the 36th Maraton Donostia - San Sebastian (more) in Spain. The Puebla Marathon (more) was run in central Mexico and the 21k Nuevo Leon (more) is run in north eastern Mexico. On 17 November the Yokohama Women's Marathon (more) and the Kobe Marathon (more) took place in Japan, the Penang Bridge International Marathon (more) in Malaysia and the Standard Chartered Bangkok Marathon (more) in Thailand. Starting in Asia and finishing in Europe, the Vodafone Istanbul Marathon (more) celebrated its 35th edition. The Turin Marathon (more) was run in Italy and the Maraton Divina Pastora Valencia (more) in Spain. The Marabana Marathon and Half Marathon (more) were held in Cuba and the Gore-Tex Philadelphia Marathon (more), the Zappos.com Rock'n'Roll Las Vegas Marathon (more) and the Big Sur Half Marathon on Monterey Bay (more) all in the United States. On 20 November the 9th Antarctic Ice Marathon (more) took place at 80 Degrees South, just a few hundred kilometres from the South Pole at the foot of the Ellsworth Mountains. 15 November: IAAF has ratified the marathon world record set by Wilson Kipsang of Kenya at the BMW Berlin Marathon on 29 September 2013. Kipsang (31) won in 2:03:23 hrs breaking the previous record of 2:03:38 set by Patrick Makau at the 2011 BMW Berlin Marathon. Kipsang's was the ninth marathon world record set in Berlin since 1977, of which the last five were all set in the past 10 years. “Wilson Kipsang – Marathon Man” is the title of a video showing Kipsang in his world record race. The video was produced by Host Broadcast Services (HBS) for SCC EVENTS. 13 November: Ingrid Kristiansen was presented with the AIMS Lifetime Achievement Award at the inaugural AIMS Best Marathon Runner’ (BMR) Award Gala in Athens, Greece on Friday 8 November 2013. Ingrid’s outstanding achievements were recognised on behalf of AIMS Members, made up of more than 350 of the world’s leading and most prestigious distance races from over 100 countries and territories. The BMR Gala was presented by the Patron of AIMS, OPAP S.A., the leading gaming operator in Greece. Ingrid received the award in recognition of her prominent role in the development of the Marathon Movement. She was fourth at the Los Angeles (inaugural) Olympic Marathon for women in 1984 and the following year set a world record (or "world best" as they were then referred to by IAAF) of 2:21:06 in the London Marathon. She won the London Marathon on three other occasions - in 1984, 1987 and 1988. 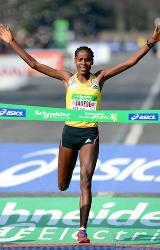 Her world record lasted 13 years, until Tegla Lorupe beat it by 19 seconds in Rotterdam in 1998. AIMS President Paco Borao comments: “In addition to being a world class athlete, Ingrid Kristiansen is a global icon for women in sport. The excellence of her perfomances is only matched by the passion & charisma she has displayed in acting as an inspiration for generations of women to take up sport and to excel at it. We are delighted to recognise her substantial contributiuon to sport, appropriately in the home of the Marathon, here in Athens, Greece”. 12 November: Great Ethiopian Run was awarded the inaugural AIMS Social Award on Friday 8 November in Athens, Greece during the first AIMS Best Marathon Runner Awards Gala. The award highlights races working towards fulfilling the eight UN Millennium Development Goals, which include eradicating extreme poverty and hunger, combatting disease, decreasing child mortality, promoting gender equality and the empowerment of women and ensuring environmental stability. Also shortlisted for the AIMS Social Award were Colombia’s Maratón de Las Flores Medellín and Algeria’s Sahara Marathon. The Great Ethiopian Run’s main objective is to introduce mass-participation running events throughout Ethiopia. Some of these are directed specifically towards "narrowing the gap" by fulfilling the Millennium Development Goals. In 2013 such an event was staged in Gondar. There will be similar races held next year in Axum and Arba Minch. The Great Ethiopian Run has in the past focused on specific campaigns such as awareness of AIDS and "Mossy Foot". As the country’s most well-known race organisation, their public position has encouraged the organisation of many other running events in Ethiopia, which have often also focused on similar health and social awareness campaigns. One of the Great Ethiopian Run’s initiatives is the ‘Every One’ campaign, conducted through the Hawassa Half Marathon, which aims to reduce infant and maternal mortality. This initiative has been running for four years, and was inspired by the death of Great Ethiopian Run Patron Haile Gebrselassie’s mother due to birth-related complications. As well as this Haile runs two schools in Asela and Bahirdar, which provide education to students who may not be able to pay the school fees. The Great Ethiopian Run also organises a series of races which help to highlight the importance of education for girls. Vice-President and Director of AIMS Programmes, Martha Morales (right), looks on as Dagmawit Amare accepts the AIMS Social Award on behalf of the Great Ethiopian Run. Photo credit: Al Boka. The 7th AIMS Marathon Symposium was conducted in Athens on 9 November. On 10 November the BDL Beirut Marathon (more) took place in Lebanon and the Athens Classic Marathon (more) over the original course from Marathon to Athens in Greece. The Maratona Int'le Ravenna Citta del Arte (more) and the Garda Trentino Half Marathon (more) were run in Italy and the French Riviera Marathon Nice-Cannes (more) in the south of France. 09 November: The SuisseGas Milano Marathon was presented with the inaugural AIMS Green Award during the AIMS Best Marathon Runner Awards Gala held on Friday evening, 8 November in Athens.. The award highlights good environmental performance in marathon events. Also shortlisted were Sweden’s GöteborgsVarvet Half Marathon and Germany’s BMW Frankfurt Marathon. The SuisseGas Milano Marathon use many different initiatives to help achieve their environmental goals. These include race participants receiving a free day ticket for public transport, while the Milan Municipality declared an “ecological day” banning all private motorised transport on the day of the race. Participants had to register their entry online and specifically opt in if they wanted to receive finisher awards and t-shirts, reducing the number required. To further reduce the amount of waste the event generated, volunteers were trained to help with waste collection and recycling, the race t-shirt suppliers reduced their packaging and 60% of the heatsheets distributed at the finish line were collected for re-use. Candidates for the AIMS Green Award were judged according to several criteria, including the impact the race has had on promoting environmentally friendly practices in marathon events, how volunteers contribute to the success of the project and the ability for the race to educate younger generations about the benefits of sport and environmental protection. This is in line with AIMS’ own environmental guidelines and the IOC Olympic Movement’s Agenda 21. The AIMS Green Award was set up in collaboration with George Kazantzopoulos, Member of the IOC Sport and Environment Commission and President of the Institute Team for the World Environmental Alliance 2004+. A jury of AIMS and independent judges shortlisted three candidates and the AIMS Board of Directors then made the final selection decision. Andrea Trabuio, SuisseGas Milano Marathon’s Race Organiser added: “We are honoured to receive this award, given all the many environmentally friendly initiatives that AIMS races around the world have implemented. We would like to thank AIMS and the sponsor of the gala OPAP for their support and recognition of our work. We believe that the Best Marathon Runner Award will not only recognise the achievements of the best marathon runners every year, but will promote our sport to the worldwide community. 08 November: At the AIMS BMR Gala held in Athens Wilson Kipsang and Edna Kiplagat were the inaugural male and female winners of the AIMS Best Marathon Runner Award for 2013, as voted for by AIMS Members, made up of more than 350 of the world’s leading distance races from over 100 countries and territories. The Gala was staged by AIMS in collaboration with the Hellenic Athletics Federation (SEGAS) and the Athens Classic Marathon and sponsored by the Patron of AIMS and ACM, OPAP S.A., the leading gaming operator in Greece. Wilson Kipsang placed 5th in the London Marathon in April 2013 (in 2:07:47) before going on to win the Berlin Marathon in September 2013 in a World Record time of 2:03:23, breaking the previous record by 15 seconds. Edna Kiplagat finished second in the London Marathon before retaining her title of World Champion in Moscow in August 2013. L to R: President of SEGAS Kostas Panagopoulos, BMR women's winner Edna Kiplagat, runner-up Priscah Jeptoo and Vice-Chairman of OPAP SA, AIMS' Patron, Mr. Spyros Fokas. The SuisseGas Milano Marathon received the inaugural ‘AIMS Green Award’ in recognition of the event’s excellent environmental practice including offering race participants a free day ticket for public transport. Also shortlisted for the award were Sweden’s GöteborgsVarvet Half Marathon and Germany’s BMW Frankfurt Marathon. The inaugural ‘AIMS Social Award’ was presented to the Great Ethiopian Run for it’s outstanding work in striving to assist in fulfilling the UN 'Millennium Development Goals". The AIMS Lifetime Achievement Award was presented to Ingrid Kristiansen in recognition of her outstanding role in the development of the Marathon Movement. She was 4th at the inaugural Olympic Marathon for women held in Los Angeles in 1984 and the following year set a world record (or "world best" as IAAF called them then) of 2:21:06 in the London Marathon. She won the London Marathon on three other occasions - in 1984, 1987 and 1988. Her world record lasted 13 years, until Tegla Lorupe beat it by 19 seconds in Rotterdam in 1998. Publicise and promote the best practice and initiatives of AIMS members (350+ race organizers) through the establishment of special environmental and social awards. On 2 November the Taroko Gorge Marathon (more) took place in a particularly scenic part of Chinese Taipei. The world running organisation the Association of International Marathons and Distance Races (AIMS) is delighted to announce that Norwegian Ingrid Kristiansen will be presented with the AIMS Lifetime Achievement Award at the inaugural AIMS Best Marathon Runner’ (BMR) Award Gala in Athens, Greece to be held on Friday 8 November 2013. Ingrid’s outstanding achievements will be recognised on behalf of the AIMS Members, made up of more than 350 of the world’s leading and most prestigious distance races from over 100 countries and territories. The BMR Gala will be presented by the Patron of AIMS, OPAP S.A., the leading gaming operator in Greece. Ingrid will receive the AIMS Lifetime Achievement Award in recognition of her significant role in the development of the Marathon Movement. She was 4th at the LA (inaugural) Olympic Marathon for women in 1984 and the following year set a world record (or "world best" as they were then referred to by the IAAF) of 2:21:06 in the London Marathon. She won the London Marathon on three other occasions - in 1984, 1987 and 1988. Her world record lasted 13 years, until Tegla Lorupe beat it by 19 seconds in Rotterdam in 1998. AIMS President Paco Borao comments: “We are delighted to recognise the considerable achievements of Ingrid Kristiansen. In addition to being a world class athlete, she is a global icon for women in sport. The excellence of her perfomances is only matched by the passion & charisma she has displayed in acting as an inspiration for generations of women to take up sport and to excel at it. We look forward to recognising her substantial contributiuon to sport, appropriately in the home of the Marathon, here in Athens, Greece on 8 November”. The event will be staged at Athens College Theater, 15 Stefanou Delta Street 15452 Psychico, Athens, Greece on Friday 8 November 2013. On 25 October the 2nd Erbil International Marathon (more) was held in the capital of Iraqi Kurdistan. 27 October, a very busy day for AIMS World Running, started with the Osaka Marathon (more) in Japan, the Chosun Ilbo Chunchon Marathon in Korea and the Thansur Bokor Int'l Half Marathon (more) in Cambodia. Action then moved to East Africa, where the Standard Chartered Nairobi Marathon (more) was run in the Kenyan capital. In Europe the Podgorica Marathon (more) was run in the Montenegrin capital, the Ljubljiana Marathon (more) in the Slovenian capital, the Venicemarathon (more) in Italy, the Swiss City Marathon (Lucerne) (more) and the Lausanne Marathon (more) in Switzerland, and the BMW Frankfurt Marathon (more) in Germany's financial capital, where super-fast times are again on the cards. The Grand Marathon International de Casablanca (more) took place in Morocco before, jumping the Atlantic, there is action on the streets of Trinidad and Tobago's capital Port-of-Spain, in the UWI-SPEC Half Marathon (more). On the North American mainland Maraton Aguascalientes (more) took place in Mexico, and the hugely popular Marine Corps Marathon (more) in Washington DC. To close, the Niagara Falls International Marathon (more) started in Buffalo, New York State and crossed from the US to Canada to finish at Niagara Falls, Ontario. On Monday 28 October, a national holiday in the Irish Republic, runners competed in the Airtricity Dublin Marathon (more). On 19 October the International Thessaloniki Night Half Marathon (more) took place in the second city of Greece. The Beijing International Marathon (more) was run through the streets of the Chinese capital on 20 October, followed in Europe by the Lago Maggiore Marathon (more) in northern Italy, the St Denis Half Marathon - La Voie Royale (more) in the outskirts of Paris, the TCS Amsterdam Marathon (more) in the Netherlands and the Mediterranean Marathon (more) and Medio Maraton Valencia Trinidad Alfonso (more) in Spain. The Scotiabank Toronto Waterfront Marathon (more), the flattest and fastest in Canada, rounded off the AIMS programme for the day. 16 October: Something outstanding happened in the 28th Spar Budapest Marathon last Sunday. Something that is worth sharing with every runner around the World. A nine-year old Palestinian child and a 14-year old Israeli child ran together hand-in-hand across Budapest's famous Chain Bridge symbolising the essence of sport, and of running itself: that there is no necessary conflict between genders, or among religions or races. The Palestinian and the Israeli children were running the 20th kilometre of the race as part of the UNICEF Charity Run, where 59 children were representing 42 countries from all over the World, running through the streets of the Hungarian Capital. Each child was running 1 km. The race recorded a record number of 22000 registrations over all the distances. Of these 4900 individual runners chose the Marathon, including 2700 international runners from 68 different countries. The Medibank Melbourne Marathon (more) started the programme on 13 October in Australia, followed by the Dong-A Ilbo Gyeongju Marathon (more) in Korea. In Europe the Spetses Mini Marathon (more) - a 25km race around the Greek Island - was followed by no less than eight marathons: The Poznan Marathon (more) in Poland, the 28th Spar Budapest Marathon (more) in Hungary, the Novi Sad Marathon (more) in Serbia, the Zagreb Marathon (more) in Croatia, the Maratona d'Italia (more) in Italy, the Munich Marathon (more) and the RheinEnergieMarathon Cologne (more) in Germany and Die Lage Landen Marathon Eindhoven (more) in the Netherlands. Across the Atlantic the Buenos Aires Int'l Marathon (more) was held in Argentina and the Maraton Internacional de Guadalajara (more) in Mexico. The Canadian West hosted the final two events of the day: the Okanagan Marathon (more) in Kelowna and the Goodlife Fitness Victoria Marathon (more) on Vancouver Island. The Association of International Marathons and Distance Races (AIMS) is delighted to announce the candidates for the inaugural AIMS Best Marathon Runner Award. The winners will be declared and awarded during the AIMS Best Marathon Runner Gala in Athens on the night of Friday 8 November 2013. Candidates will be voted for by full members of AIMS. The voting period opened on 10 October and continues until 1 November. The winners in both male and female categories will be declared and awarded at the AIMS Gala in Athens on 8 November 2013. On 4 October the Samsung Amman International Marathon (more) was run in the Jordanian capital. On 6 October the Colombo Marathon (more) took place in Sri Lanka. In Europe the Bila Tserkva Marathon (more) was held in Ukraine, the Bucharest Int'l Marathon (more) in Romania, Europe's oldest, the Kosice Peace Marathon (more) in Slovakia, the "Three Countries" Marathon (more) on the Swiss, Austrian and German borders, the Brussels Marathon (more) in Belgium and the EDP Rock & Roll Lisbon Marathon (more) in Portugal. In North America the Portland Marathon (more) took place on America's west coast, while further south the Maraton Corona Queretaro (more) was run in Mexico, the Gatorade Caracas Rock 10km (more) in Venezuela, the Guyaquil Marathon (more) in Ecuador and the Jungle Marathon (more) in Brazil. On 29 September the Standard Chartered KL Marathon (more) was held after being postponed from its usual June date due to fallout from forest burning. At Lake Tahoe, three marathons were run on consecutive days, culminating in the 18th Lake Tahoe Marathon (more). The BMW Berlin Marathon (more) celebrated its 40th edition with a reunion of past world record breakers on the course including Patrick Makau, Haile Gebrselassie, Paul Tergat, Ronaldo Da Costa, Naoko Takahashi and Tegla Lorupe. Kenya's Wilson Kipsang set a new world record with a time of 2:03:23 eclipsing the previous record set by his compatriot Patrick Macau at the same event 2 years ago with a time of 2:03:38. Elsewhere in Europe the 34th Warsaw Marathon (more) was run in the Polish capital and the Baxter's Loch Ness Marathon (more) in the north of Scotland. The BIL Route du Vin Half Marathon (more) was held in Luxembourg and the Singelloop Utrecht 10km (more) in the Netherlands - both on very fast courses. The Carrera de la Mujer (more) women's series staged its Bogota event in the Colombian capital. The Danske Bank Oslo Marathon (more) was held on 21 September. On 22 September the Sydney Marathon (more) took place as part of the Blackmore's Sydney Running Festival in Australia, the Siberian International Marathon (more) was run in Omsk, the Cape Town Marathon (more) in South Africa, and the Timisoara Marathon (ROU) and the Hans Christian Andersen Marathon (DEN) (more) in Europe. Elsewhere in Europe the Varadzinski Half Marathon (more) was held in Croatia, the Maratonina Citta Di Udine (more) (half marathon) in Italy, the Dam tot Damloop (more) over 10 miles in Amsterdam and the Charleville Int'l Half Marathon (more) in Ireland. The Maui Marathon (more) closed the day's race schedule In the Hawaiian Islands. On 14 September the Jungfrau Marathon (more) was run in the Swiss Alps, climbing to a height of 2100m. The DN Stockholm Half Marathon (more) was held the same day in the Swedish capital. On 15 September the Moscow Marathon (more) debuted under new organisation. Elsewhere in Europe there were marathons in the Lithuanian capital Vilnius (more), the Polish city of Wroclaw(more) and along the banks of the Danube at Wachau (more) in Austria. There were half marathons in Usti nad Ladem (more) (Czech Republic) and Oporto (more) in northern Portugal and Powerade Copenhagen Half Marathon (more) in Denmark. On 7 September the O2 Prague Grand Prix METRO 10km (more) kicked off the last of the RunCzech series of events for the year. The women contested the adidas 5km event. On 8 September the autumn season started in earnest, with six European events: the SEB Tallinn Marathon and Half (more) in Estonia, the Pila Int'l Half Marathon (more) and the Marathon of the Running Festival of the Economic Forum (more) in Poland; the 28th Nike Budapest Int'l Half Marathon (more) in Hungary; and the Volksbank Munster Marathon (more) in Germany. On the other side of the Atlantic the 10km Int'l Costa Rica (more) was run in San Jose, and the Maraton de las Flores Medellin (more) in Columbia's second city. On 31 August the Fjord Norway Half Marathon (more) was held in the Norwegian town of Knarvik, just north of Bergen. In the Ecuadorian capital Quito the Ruta de las Iglesias 10km (more) started in torchlight from the centre of town at 19:00. On 01 September the Torshavn Marathon (more) was run in the Faroe Islands. 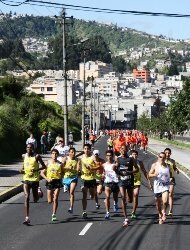 Across the Atlantic the Medio Maraton Atlas (more) took place in Mexico's second city, Guadalajara. On 24 August the Hvar Half Marathon (more) was run on the Croatian island in the Adriatic Sea and in Iceland the Islandsbanka Reykjavik Marathon (more) celebrated their 30th anniversary race. 25 August started with two races in Australia: the Sunshine Coast Marathon (more) in Queensland and the Athlete's Foot Adelaide Marathon (more) in South Australia. The Hokkaido Marathon (more) took place in the north of Japan. In South Africa the Mandela Day Marathon (more) was held for the second time over a testing course from where Nelson Mandela gave his last public address before his long imprisonment to the site at which he was captured some 17 months later. The Longford Marathon (more) in Ireland was the only AIMS race of the day to be held in Europe. The SSQ Quebec Marathon (more) and Canadian Derby Edmonton Marathon (more) took place in Canada and the Maraton de la Ciudad de Mexico (more) in the Mexican capital. In the Men's Marathon of the IAAF World Championships (more) in Athletics, held in Moscow on the afternoon of , Olympic Champion Stephen Kiprotich shook off a trio of Ethiopians to clinch the title in 2:09:51. On the same day the Helsinki City Marathon (more) was run in the neighbouring country of Finland. The AIMS Children's Series race held on 3 August in Asuncion proved stiff competition for the title event, the Maraton International de Asuncion (more) held the following day writes AIMS President Paco Borao. 1500 children from the age of six to 16 filled the Ñu Guazu Park in the biggest ever running festival held in Paraguay. This was the first such event to be held in the country, financially supported by AIMS, and organized by the Paraguay Marathon Club (PMC) with the cooperation of the Foundation Dequení and several private groupings. It was a great success for all, and primarily for the PMC, who were of course also responsible for organizing the Maraton Internacional de Asunción the following day. In the early morning dozens of buses transported the children from different regions of the country, to participate in the races organized by age groups. The enormous success achieved was because of the further support of the many parties involved: parents, relatives, teachers, organisers, supportive media coverage, which all helped to create the successful sporting and social fiesta. From the beginning of the races the yellow AIMS T-shirts stood out, and the treasured medals for having completed the distances set for the different age groups were received with great excitement by the children. Local sponsors offered games, food and drinks, helping to complete a journey which will be long remembered by all those who were witness to this first AIMS Children’s Race in Asunción. Thanks to all who attended and made it possible, under the coordination of Myrta Doldán and Marcelo Ithurralde, President and Vice-president of the PMC. On 3 August the final AIMS Children's Series (more) race of 2013 took place in Asuncion. On 4 August the Maraton Internacional de Asuncion (more) followed the children's event of the previous day. Earlier the same day two events were held in the Australian state of Queensland; the Brisbane Marathon Festival (more) and the Townsville Marathon and Running Festival (more). On 27 July the Australian Outback Marathon (more) was run on "red dirt" roads within sight of Uluru (Ayer's Rock) the sacred Aboriginal site in Central Australia. races at 78km, 42km, 30km, 21km and 10km. On 28 July the Westlink M7 Cities Marathon (more) was held in Blacktown, NSW Australia, and the Metro Manila edition of the MILO Marathon (more) in the Phillippine capital. Runners in the Ultramaratona Atlantica Melides-Troia (more) splashed their way on a 43km long beach run, scheduled so that the tides allow it, up the Portuguese coast near the town of Grandola. The Medio Maraton de Bogota (more) was run in the Colombian capital. The Zelenograd Half Marathon was held on 21 July, just 40km outside the Russian capital, Moscow. On 14 July the Yang Min Shan Half Marathon due to take place in one of Chinese Taipei's National Parks, had to be cancelled because of Typhoon Soulik. The Marathon de L'Ile Maurice (more) was run on the scenic Indian Ocean island of Mauritius. The Victoria Falls Marathon (more) was run in Zimbabwe next to one of the natural wonders of the world, and the Maraton de Quito (more) was held at 2800m altitude in the capital of Ecuador. 13 July: Nelson Mandela will be 95 on 18 July 2013, if he survives the next week. The former President of South Africa (1994-1999) was taken to the Mediclinic Heart Hospital in Pretoria on 8 June with a serious recurring lung infection, and is now spending his 35th day there. However things play out in the coming days and weeks, his legacy as an icon of some of the best human qualities - integrity, tolerance and fortitude - will live on. One part of that legacy, the Mandela Day Marathon, will be held for the second time on 25 August, and: "it is proving a major draw for runners who want to be part of history" reports Ray De Vries. Both the marathon 10km events are capped at 2500 runners, and these limits will be reached very soon. Star entrant will be Willie Mtolo, a South African runner who burst through to international stardom at the same time as the apartheid regime in South Africa was in its death throes. He won the 1992 New York City Marathon at the dawn of the post-Apartheid era, and has supported the Mandela Day Marathon from its inception. The Marathon starts in Imbali, an outlying district of Pietermaritzburg, right outside the Manayi Hall (formerly known as Arya Samaj Hall) where Nelson Mandela delivered his last public speech on 25 March 1961, at the All-in-Africa conference before his 27-year imprisonment by the apartheid regime. It ends at the famous "capture site" near Howick where Mandela was stopped on the roadside and taken into custody on 5 August 1962. "As soon as I heard about this marathon I knew I had to be part of it." said Mtolo, who lives in Pietermaritzburg. "Madiba [Mandela's clan name for him] is my hero and this will be a very emotional marathon for me to run. One of my first jobs was as a barman in a local hotel in Pietermaritzburg. I now have a few businesses, in fact my butchery is on the route itself". Mtolo has become an enthusiastic ambassador of the event. On 6 July the Zermatt Marathon (more) was run on a breathtaking uphill course in the Swiss Alps. On 7 July the Gold Coast Airport Marathon (more) took place in the Australian resort on the Queensland coast, the Sotokoto Safari Half Marathon (more) was held in Kenya, the Rio de Janeiro City Marathon (more) in Brazil and the Correcaminos Half Marathon and 10km (more) in Costa Rica. 02 July: Dr Pedro Pujol, founder member of IMMDA and the longtime medical director of the Barcelona Marathon, passed away earlier today in a hospital in Barcelona. Born on 12 February 1931, Dr Pujol became one of the foremost authorities on medical aspects of endurance running. His close collaboration with Professor Dr Ernst Van Akken (Germany) in a study on endurance in women marathon runners led to him becoming a Member of the Deutscher Verband langlaufender Ärzte, and provided major encouragement to the cause of women's running. He also collaborated with Dr David Martin (USA) in various studies of heat related problems in endurance athletes, and also became a Fellow of the American College of Sport Medicine. Dr Pujol was Medical Director of the Olympic Training Center (CAR), Sant Cugat, from 1992 to 2009, and Olympic Medical Director for Marathon and Race Walking at the Barcelona Olympic Games of 1992. He followed on as a member of the American Medical Team at the Olympic Games in Atlanta in 1996 and in parallel acted as Medical triage captain at the finish line of the New York City Marathon for more than 20 years. He was a former President of the International Marathon Medical Directors Association. AIMS President Paco Borao said "the running community yesterday lost one of its greatest defenders, and one of the best professionals in the medical area, always working with the maximum of commitment and friendship. I have been in touch with his family since Pedro was also a close friend of our Valencia Marathon since the first edition in 1981. It is an enormous loss for all of us. The multi-gold medallist, who lost his left leg to cancer at the age of nine, is nervous: "My preparation so far has not been great.. [and] 42.195km is a great unknown for me", Michael said. The 40-year-old from Canberra is one of Australias most successful winter athletes having represented Australia at five Paralympic Games as a skier and one as a cyclist, winning a total of 11 medals. He holds the Australian speed skiing record at 213.65km/hour, has climbed Mt Kilimanjaro and has most recently represented Australia at the World Triathlon Championships. But it is the glory of finishing a marathon that Michael wants the most. There were two Marathons held in Finland on 29 June: the Paavo Nurmi Marathon (more) in Turku, and the Rovaniemi Marathon (more) at 66degN, which involves a double crossing of the Arctic Circle. The Northwest Passage Marathon at Arctic Watch Wilderness Lodge (more) was run on 3 July on Somerset Island in the new Canadian Province of Nunavut. It is North America’s most northerly marathon, held under the 24-hour Arctic sun and against the backdrop of the fabled Northwest Passage. 24 June: AIMS announces a major new international event, the annual AIMS "BEST MARATHON RUNNER" (BMR) Award Gala. The inaugural 2013 edition will take place on the evening of Friday 8 November in Athens, Greece. This event will become the major commemorative event of the Marathon movement worldwide. 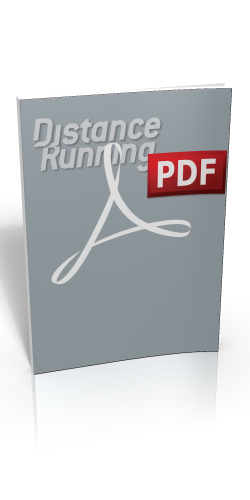 One of AIMS‘ main objectives is „to foster and promote distance running throughout the world“. The AIMS BMR Award Gala will recognize the achievements of the World’s best runners every year, and will project the image of the Marathon movement, recogning the myriad benefits it brings to the community. AIMS members will have a key role in this new event by voting (every October) for the AIMS BEST MARATHON RUNNER of the year in both male and female categories. The result will be disclosed for the first time during the BMR Gala on Friday night 8 November 2013. AIMS’ Patron, OPAP S.A., the leading gaming operator in Greece, will be the major sponsor. i) announce an honour the best male and female Marathon runners of the year. ii) recognise and honour exceptional Marathon figureheads and personalities for their contribution to the development of the Marathon movement. iii) publicise and promote the best practice and initiatives of AIMS members (350+ race organisers) through the establishment of special environmental and social awards. iv) enhance the role, programmes and services of AIMS. The Gala will take place at the theatre of Athens College, an 830-seat auditorium located on a wooded 37-acre (15 hectare) site in the Psychico district of Athens, close to the centre. The televised award ceremonies will last one hour, and be followed by a buffet. 24 June: AIMS will make a special new award to recognise good environmental practice in distance running events, the ‘AIMS Green Award’. AIMS Members will be able to submit an application to be considered for this award. The AIMS Green Award will be given to the AIMS member that best showcases good practice in the protection of the environment when organising a distance running event. The award will be presented at the inaugural 'AIMS BEST MARATHON RUNNER’ (BMR) Award Gala which will take place on the evening of Friday 8 November 2013 in Athens, Greece. The AIMS Green Award has been set up in collaboration with Mr. George Kazantzopoulos, Member of the IOC Sport & Environment Commission since 2002 and President of the Institute Team for the World Environmental Alliance 2004+, a scientific non-governmental not-for-profit organization. AIMS’ intention is not only to honour the environmental initiatives of its members, but also to help them improve their races by employing good environmental practices in their events. To this end, AIMS has established a set of environmental guidelines, in line with the IOC Olympic Movement’s Agenda 21, over and above the creation of the AIMS Green Award. On 22 June the latest event in the RunCzech series, the Olomouc Half Marathon (more), was run in the Czech Republic, and the Midnight Sun Marathon (more) in Tromso, at 70 deg.North in Norway. On 23 June the Vidovdan Road Race (more) and children's races took place in Brcko, Bosnia, the Telesia City Trophy 10km (more) in Italy, the Tangamanga Marathon (more) in Mexico and the Scotiabank Vancouver Half Marathon (more) on the west coast of Canada. On 24 June the Suzuki Midnight Sun Run (more) was held in Iceland. On 15 June the Lanzhou International Marathon (more) took place in China. The Santa Claus Marathon (more) was run in Rovaniemi, on the Arctic Circle in Finland, and the Portumna Forest Marathon (more) in Ireland. On 16 June the BII Bali Marathon (more) was held in Indonesia, and 16 time zones later, the San Francisco Marathon (more) in California. On 8 June the Mattoni Ceske Budejovice Half Marathon (more) took place as the latest event in the RunCzech Series. On 9 June the Laguna Phuket International Marathon (more) was run in the Thai resort town. The Manly Soft Sand Classic 21km, scheduled for the 9 June, has been postponed until November. On 1 June the 35th ASICS Stockholm Marathon (more) took place in the Swedish capital. On 2 June the 88th edition of the Comrades Marathon (more) was run on an 87km course from Durban to Pietermaritzburg in South Africa and the RAHAL Casablanca 10km (more) in Morocco. The Gatorade Panama Int'l Half Marathon (more) was held in the central American country and the Ultimas Noticias 15km road race (more) in the Ecuadorean capital Quito, at an altitude of 2800m. On 3 June (Monday) the Cork City Marathon (more) took place in Ireland's second city. On 26 May the Jacob's Creek Barossa Marathon (more) took place in South Australia, The Cayirova Int'l Half Marathon (more) was run at the eastern end of Turkey's Sea of Marmara, and the Edinburgh Marathon Festival (more) in the Scottish capital. The Ottawa Marathon (more) was held in the Canadian capital and the 49th edition of the Scotiabank Calgary Marathon and Half Marathon (more) in the province of Alberta. On 25 May the 25th Terwamaraton (more) was held in the Finnish town of Oulu and the Mattoni Karlovy Vary Half Marathon (more) in the Czech Republic. 25 May: The corner house between Milady Horákové and Františka Křížka Streets in Letna, Prague 7 has been transformed into a Running Mall and unparalleled running crossroads in the heart of Europe. The ground floor will be home to the main reception with a cafe and water bar alongside, a specialized adidas running store, a conference room and running club facilities including dressing rooms and showers. Runners can drop by to head out for a run in nearby Stromovka or Letna Park. The top floor will be the main base for the Prague International Marathon and the RunCzech Running League. 25 May: This year’s Prague Marathon saw a record number of 9,500 runners and a high-class elite field held little more than one month after the Hervis Prague Half Marathon. But today, just two weeks after the Marathon the busy Run Czech team staged their next event, a new half marathon in Karlovy Vary. In total the team now organise seven races across the Czech Republic. The Run Czech Running League, as the series is officially called, has become a notable success with events usually sold out weeks in advance. This year a record total of 48,000 runners are expected to take part in these races. It all started back in 1994, when the inaugural Prague Marathon attracted 985 runners, although including the other events the total was around 15,000. “We wanted to create one platform - the Run Czech Running League. We have the same sponsors and the same suppliers. The organising team is the same as well as the whole set-up, for example the construction of the start and finish areas. The elite fields are also very strong and all races are shown live on Czech TV. The third Prague race - the Mattoni Grand Prix 10km was established by 1999, but only in 2010 did the Olomouc Half Marathon become the first race outside Prague. A year later another half marathon followed in the northern city of Usti nad Labem, while the Mattoni Ceske Budejovice Half Marathon was added in 2012. The event in Karlovy Vary is new this year. No other big road running events existed in these cities but to avoid possible conflicts with local organisers Run Czech helps other smaller races in the Republic. “We all benefit from this - the more people start running the better for all of us. Run Czech has more than doubled participation in the last five years. Run Czech has also introduced a new competition format, where runners are ranked according to their profession and age group. For example teachers compete against each other on an annual basis within the Run Czech Running League. They can collect points for each of their races. The three best performances are added together at the end of the season. Each age category also has a winner. Next year participants will be able to collect points in eight races, because Run Czech will introduce a new half marathon in Ostrava. 25 May: Jack Fitzgerald was an indefatigable ultra distance runner and race organiser. He was closely involved in the formation of both the British Veterans Athletic Federation and the World Association of Veteran Athletes (later World Masters Association). After serving in the Royal Air Force during the Second World War Jack joined Mitcham AC in 1947 and debuted in the Poly Marathon in 1950 with a time of 3:03. He ran his best time of 2:39 when he was already over 40 and developed a natural interest in veteran athletics. He served as Hon. Secretary of Mitcham AC and when it became Sutton and District Athletic Club he became Chairman. For many years he organised the Mitcham 15 miles (later 25km) road race in south west London. Jack attended a meeting in Toronto from 11-16 August 1975, hosted by Don Farquharson, Chairman of the Local Organising Committee for a meeting styled as the first Word Championships for Masters (who were then also known as ‘Veterans’). There were 1427 competitors who attended, representing 32 countries. The meeting convened formed WAVA – the World Association of Veteran Athletes – of which Jack Fitzgerald became Chairman and Farquharson the Secretary and Treasurer. Jack ran 3:16 for a marathon at the age of 69, but after an operation two years later switched to race walking. He celebrated his 90th birthday in January 2013, but died at a residential home in Putney where he moved after several weeks in St George's Hospital, South London. On 18 May the Great Wall Marathon (more) was held in China, the Three Hearts Marathon (more) in Slovenia and the Goteborg Half Marathon (more) in Sweden. On 19 May the Gifu Seira Half Marathon (more) was run in Japan and the TCS World 10km Bangalore (more) in India. The Kigali Peace Marathon (more) was held in Rwanda and in Europe the Bucharest Int'l Half Marathon (more) took place in Romania, the Nordea Riga Marathon (more) in Latvia, the iWelt Marathon Wuerzburg (more) in Germany and the Nykredit Copenhagen Marathon (more) in Denmark. The Movistar Lima 42km (more) was run in Peru. On 21 May the Tripoli Int'l Half Marathon was held in Lebanon's second city. In the Volkswagen Prague Marathon (more) on 12 May Nicholas Kemboi and Caroline Rotich took the line honours in atypically modest times but by comfortable margins in 2:08:51 and 2:27:00. The Skopje Marathon (more) was run in FYR Macedonia and the Silesia Marathon (more) in Poland. 09 May: The 35th Gold Coast Airport Marathon in Australia is on track to become the biggest in its history. It's also likely that more women than men will hit the flat Gold Coast streets on the 6-7 July race weekend. The program features full and half marathons, 10km, 5.7km, 5.7km Challenge and 4km and 2km Junior Dashes. Entries across all events are almost 29% up on last year, when 28,000 eventually started over the two days, including 73% from outside the region. General Manager Cameron Hart said the ASICS Half Marathon has been particularly fast out of the blocks with 38% more registrations, largely thanks to the early enthusiasm of female runners. "We dont really know why, but almost twice as many women as men have entered so far" he said. "Women are also likely to dominate the fields in several of our other events if the current trend continues". The Gold Coast Airport Marathon is supported by the Queensland Government through Tourism and Events Queensland as part of a growing calendar of sporting, cultural and regional events. For more information: www.goldcoastmarathon.com.au. On 4 May the Volgograd Marathon (more) took place in Russia. On 5 May In the BIG 25 Berlin (more) both winners clocked world leading times at 25km, Richard Siei with 1:13:34 and Lucy Kabuu with 1:21:37. The Steinmetz Gaborone Marathon (more) in Botswana was won by Kenyans Lukje Chelimo (2:15:25) and Peris Chepkorir (2:39:31). The Genève Marathon for Unicef (more) in Switzerland attracted a total of more than 9000 runners. The Salzburg Marathon (more) yielded a course record for Eliud Kiplagat (2:14:16) and a repeat win for Joan Rotich (2:36:10). The Maratona d'Europa (more) was held in Trieste, Italy and the BMO Vancouver International Marathon (more) and the Goodlife Fitness Toronto Marathon (more) were run in Canada. The Deep Riverrock Belfast City Marathon (more) and the Milton Keynes Marathon (more) took place in Great Britain on 6 May, a public holiday. On 27 April the Gunsan Saemangeum International Marathon (more) was run in Korea. On 28 April the Cracovia Marathon (more) was held in Poland, the Metro Group Marathon Dusseldorf (more) in Germany and the Rock 'n' Roll Madrid Marathon (more) in the Spanish capital. The Big Sur International Marathon (more) took place along the Californian coast in the USA. 24 April: Since 2010 the Big Sur International Marathon, run along California's scenic Highway One, has welcomed a special category of runners who take up the challenge of competing in the historic Boston Marathon followed directly by Big Sur either six or 13 days later. This year’s Boston 2 Big Sur (B2B) Challenge has taken on much greater significance, as the race unites runners between the two coasts. 400 runners signed up for the challenge which sold out months ago. Those who were not able to finish last Monday’s Boston Marathon, following the bomb blast at the finish line, will still receive a B2B finisher’s medallion, finisher’s jacket and a welcome into the B2B tent following the race on Sunday 28 April 28. At the Big Sur Health & Fitness Expo, there will be a special Boston Tribute area where runners can write messages on a large banner and to share experiences. A moment of silence will be observed at the start of each race (marathon, 21, 10.6 and 9 milers & 5km). Race organizers anticipate many additional personal tributes via signage, personalized shirts and more. One marathoner will be running alongside the 4:15 pace team with a sign to honor victims of the Boston explosions. April 21 was a busy spring weekend of running starting with the Nagano Olympic Commemorative Marathon (more) in Japan. The Belgrade Banca Intesa Marathon (more) was run in the Serbian capital, the International Marathon Alexander the Great (more) in Greece, the DVV Antwerp Marathon (more) in Belgium, the Nice International Half Marathon (more) in France, and the Haspa Marathon Hamburg (more) in Germany, the Maratona Sant Antonio (more) and Turin Half Marathon (more) in Italy, and the Enschede Marathon (more) in the Netherlands. Moving west, the Santiago Corre 10K was run in the Dominican Republic, and to cap the day the Vancouver Sun Run 10k (more) was run on Canada's Pacific west coast. On 20 April the Pardubice Wine Half Marathon (more) was held in Slovakia. "All in the running world are deeply shocked and saddened by what has happened today at the Boston Marathon. Our thoughts are with the victims and all those affected by these tragic events especially everyone in Boston and the United States and also the thousands of families from around the world who have family members taking part in or travelling to watch the race. We are awaiting further information as to the extent of the casualties and the reasons behind the unfolding events. It is appalling that anyone would target innocent people travelling from across the world of all faiths, nationalities and races simply to come together to enjoy a sporting event. Sport has always been a champion of peace and friendship regardless of any ethnic, political or religious affiliation. We very much hope that the authorities will find and hold responsible the perpetrators of this shocking incident. Everyone in the global running community’s thoughts are with the victims of this terrible tragedy." In the Sao Paulo Half Marathon Corpore (more) in Brazil Fredison Carneiro Costa and Sirlene Sousa De Pinho ran out winners in 1:07:07 and 1:20:51 respectively. The 117th edition of the BAA Boston Marathon (more) was run on Monday 15 April. 07 April: Apple Daily, the multi-media Hong Kong newspaper, will send two reporters to the 2013 UVU North Pole Marathon, scheduled for 9 April. A series of 20 video news reports will focus on the final preparations for the race from Svalbard (Norway), the departure point for the North Pole Marathon. These reports will be followed by news coverage of the race itself and insights into topical issues such as the impact of global warming on the Arctic region. Apple Daily is the leading source of online news in China and the top smartphone news app in Hong Kong and Taiwan. During marathon week, Apple Daily's news reports can be accessed through the company's website at http://hk.dv.nextmedia.com/actionnews/index/. 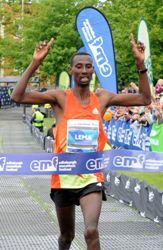 Feyse Tadese set a world-leading time of 2:21:05 in winning the Paris Marathon (more) on 7 April. Peter Some ran the second fastest ever time over the course to win the men's race in 2:05:38. In the Vattenfall Berlin Half Marathon (more) Jacob Kendagor broke the hour with 59:36 and Helah Kiprop took the women's race in 1:07:54. Martin Mukule and Lucy Njeri won the Poznan Half Marathon (more) in 1:03:29 and 1:11:10 respectively. Both course records fell in the Zurich Marathon (more) - to Tadese Abraham (SUI) in 2:07:44 and Lisa Stublic (SKLO) in 2:25:44. In the Milano City Marathon (more) both Worku Biru Gemenchu and Monica Jepkoech triumphed in tight finishes, 2:09:25 and 2:32:54. The Medio Maraton de Madrid (more) and the Semi Marathon de Rabat (more) were run in the Spanish and Moroccan capitals and the Maraton de Santiago (more) in the Chilean capital. In the Hervis Prague Half Marathon (more) on 6 April Gladys Cherono ran the fourth fastest time of the year, 1:06:48, despite the windy conditions which prevented men's winner and world record holder Zersenay Tadese from breaking the hour (1:00:11). On 5 April the Dead Sea Ultramarathon (more) 50km was run from the Jordanian capital, Amman to the shores of the Dead Sea. 05 April: Now landed in Buenos Aires and already dispersing back to their countries of origin, runners in this year's 14th edition of the Antarctica Marathon (more) had a rougher ride than usual in getting to the race venue. Initially scheduled for 7 March the race came close to being put on ice when the Akademik Ioffe, the chartered Russian research vessel that was to transport the runners from the southernmost tip of Argentina to King George Island, just off the Antarctic Peninsular, was damaged by an iceberg. Sister ship the Akademik Sergey Vavilov was quickly commissioned but resulted in a three-week delay. More than 85% of the original 114 travelers rearranged their lives to pursue their goal of completing the marathon or half-marathon on the seventh continent. 17 runners fulfilled this goal in the race held on 30 March and were inducted into the Seven Continents Club during the post-race awards ceremony held at an outdoor barbecue. 03 April: Vince Regan, one of the 29 founder members of AIMS, passed away this morning after a fight with cancer. After starting the Pony British Marathon in Bolton, he attended the preliminary meeting held in Honolulu in December 1981 and the "establishing Congress" held in London on 6-7 May 1982. After AIMS' foundation at that meeting he became the Association's press officer, from 1988-1991 sharing that role with Manfred Steffny. He also founded Sports Tours International, a Manchester-based company offering tours to overseas Marathons for British runners and consequently became a regular presence at AIMS expo booths around the world. Despite the rapid expansion of the business into other sports, Vince continued to be involved with AIMS and attended the 19th World Congress of AIMS held in Prague in May 2012. Longtime Chief Executive of the Boston Marathon, Guy Morse, said: "He was a true friend, both personally and professionally, and his love and enthusiasm for our sport was legendary. I will miss welcoming him to Boston each April, and to sharing time with him at marathons around the world. Vince's tireless work ethic, knowledge and contributions to the sport and the business of running, and in particular to AIMS, will be missed and his memory cherished by many. We mourn the loss of 'one of the good guys'." 01 April: With the 2013 Old Mutual Two Oceans 56km only having been held on Easter Saturday, 30 March, the dust had not settled before race organisers were announcing a major boost for the next edition on 19 April 2014: a million-rand bonus for breaking the course records These have stood at 3:03:44 to Thompson Magawana (since 1988) and 3:30:36 to Frith van der Merwe (since 1989). Next year marks the race's 45th anniversary and the 15th year of sponsorship by the financial services company, Old Mutual. The closest anyone has come to the records has been the Zimbabwean three-time winner Marko Mambo, in 2005, with 3:05:39 and the Russian Olesya Nurgalieva, with 3:34:53 in 2008. According to Ralph Mupita, CEO for Old Mutual Emerging Markets, “We want to encourage top runners from around South Africa and the rest of Africa to come and compete in the biggest road running event on the African continent.” This year David Gatebe (RSA) and Natalia Volgina (RUS) won in 3:08:54 and 3:38:38 respectively. Runners from South Africa, Lesotho and Zimbabwe filled the top-10 men's places and additionally from Russia, Great Britain, Uganda and Kenya the women's top-10. On 30 March the Old Mutual Two Oceans Marathon (more) was run over its traditional 56km distance on its traditional Easter Saturday date. On 31 March the Incheon International Half Marathon was held in the Korean port city, and the Khourigba OCP 10km on the Atlantic coast of Morocco. (POL) on 24 March. Faith Kipyegon retained her junior women’s title and Emily Chebet reclaimed her senior title from 2010. In the final event of the afternoon the US men’s team delivered a result that has not been seen for decades, as they edged Kenya for the silver medals. On 15 March the Tel Aviv Gilette Marathon (more) due to take place in Israel, was postponed due to extreme heat. The half marathon even was run. On 16 March Peter Lawrence (2:32:27) and Ashley Olsen (2:53:28) won the Rock n Roll USA Marathon (more) in Washington DC. On 17 March Franklin Chepkwony (2:06:59) and Philomena Chepchirchir (2:25:43) scored a Kenyan double in the Seoul International Marathon (more). Helena Kirop (2:24:40) and Getachew Terfa Negari (2:07:56) took victories in the Rome Marathon (more). The Zurich Marathon of Barcelona (more) was run in Spain and the Stanley Marathon (more) in the Falkland Islands. The 100km del Sahara (more) was held between 5-8 March in Senegal. On 1 March the Jerusalem Marathon (more) was run through the Holy City and in Tripoli Silas Kipruto recorded a world leading time in the Libyan Open Int'l Championships 10km (more). 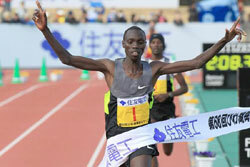 On 3 March Vincent Kipruto won the Lake Biwa Mainichi Marathon (more) in a time of 2:08:34, the New Taipei City Wanjinshi Int'l Marathon (more) was held in Taiwan. In Turkey Murat and Lutfiye Kaya won the Oeger Antalya Int'l Marathon (more) in Turkey in 2:36:35 and 3:01:29. The Kilimanjaro Marathon (more) took place in Tanzania and the Treviso Marathon (more) in northern Italy. 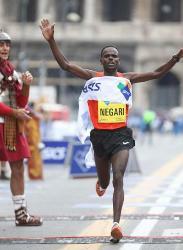 Abebe Negowo (1:01:33) Pauline Njeri (1:08:58) won the Semi Marathon Int'l de Paris (more) in France. In the Lala Marathon (more) in Mexico Isaac Kimaiyo (2:13:56) and Truphena Jemeli (2:37:03) ran out winners. On 24 February the Tokyo Marathon (more) took place in Japan, followed by the Standard Chartered Hong Kong Marathon (more). On the same day the Sunyang Seychelles Eco-Friendly Marathon (more) was held along a coastal route in the Indian Ocean island state. The Maritzburg Marathon (more), in South Africa, follows on from the one-day AIMS Regional Conference held in Pietermaritzburg two days earlier on Friday 22 February. In Europe the Seville Marathon (more) was run in the south of Spain, and across the Atlantic the World's Best 10k (more) took place in San Juan, Puerto Rico and the CAF Caracas Marathon (more) in the Venezuelan capital. In the Ras Al Khaimah Half Marathon (more) on 15 February Geoffrey Kipsang won a very competitive men's race in 58:54, with Stanley Biwott and Geoffrey Mutai also gong under 59 minutes. In the women’s race Lucy Kabuu ran the second fastest time ever to win in 1:06:09 just two seconds ahead of Priscah Jeptoo, as four women broke 67 minutes for the first time. On 17 February the Ohme-Hochi 30km road race (more) took place in Japan, and the Medio Maraton de Guadalajara (more) in Mexico. 14 February: Prior to the Ras Al Khaimah Half Marathon, to be held on 15 February Geoffrey Mutai was awarded the title of AIMS/ASICS Athlete of the Year for 2012. Race Director Nathan Clayton, on behalf of AIMS, presented Mutai with the acclaimed Golden Shoe Trophy. 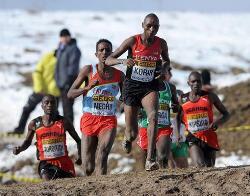 It is the second year in a row that Mutai (31) has won the award. Mutai started to post a string of eye-catching performances on the road after his 59:30 win in the Valencia Half Marathon in 2009. In 2010 he ran 2:04:55 in finishing second in Rotterdam, and second in Berlin only 15 seconds slower than that before rounding off with a 59:38 victory in the Delhi Half Marathon. In 2011 he replaced his runner-up spots with two sensational victories in the Boston Marathon, where on an "assisted" course he ran the fastest ever time of 2:03:02, and in New York, where he smashed the record with 2:05:06. He also recorded a personal best for 10km at 27:19 in Boston. Missing Olympic selection in 2012 Mutai instead won the Berlin Marathon in a world leading 2:04:15 - but only a second ahead of his training partner, Denis Kimetto. His winning time in the Boston 10km, 27:29, was enough for him to lead the rankings at that distance as well. The AIMS/ASICS World Athlete of the Year Awards were founded in 1992 and are decided each year from nominations made by the 350 member races of AIMS. Nathan Clayton said “I am honoured to be able to host this presentation at the Ras Al Khaimah Half Marathon." 10 February: The Sahrawi Government and the organizing committee of the Sahara Marathon have been forced to postpone the Sahara Marathon 2013. The recent war in Mali and the tragic kidnapping that occurred in Algeria have caused huge international concern that forced us to take this sad decision. Given the instability in the region and threats of further violence from terrorist groups against Western targets, the Sahrawi government temporarily suspended all visa processing and have repatriated displaced social workers. In these circumstances it would be irresponsible to encourage 200 runners from over 20 countries to travel to Algerian territory. Most of these countries have made serious appeals to their citizens not to travel to the area. Sahrawi and Algerian authorities have done a commendable job as far as security is concerned in recent months, but the organization of a long distance race in these conditions requires an enormous logistical and financial effort, which cannot be asked of people surviving in refugee camps. All measures taken by the authorities are directed towards avoiding any risk to the solidarity built up between runners and Sahrawi people themselves. Soon we expect to be able to make a new call for the 2014 Sahara Marathon, a race with a huge international reputation thanks to the support of the runners and the hospitality they receive from the Sahrawi families. Organizers and the Sahrawi Ministry of Youth and Sports will go on with some actions to support the humanitarian projects of the Sahara Marathon. The first is to organize the children’s races and other local activities for the Sahrawi refugees. In some European cities we will stage charitable races under the umbrella of the Sahara Marathon to raise funds to send a truck with all the sports equipment and solidarity that we have received. The disappointment felt by the team and the runners who prepared this trip will not weaken our commitment to help these people and to demand the justice denied to Western Sahara for the last 38 years . In a ceremony following the Kagawa Marugame Half Marathon in Japan, Tiki Gelana was named as the female AIMS/ASICS World Athlete of the Year for 2012, the first time the award has been won by an Ethiopian woman.. President Emeritus of AIMS Hiroaki Chosa and AIMS Board Member and Vice President of the Japanese Association of Athletics Federations Dr Keisuke Sawaki presented her with the Golden Shoe Trophy. Gelana (25) joins male compatriots Gezahenge Abera (2000) and Haile Gebrselassie (2006, 2007 & 2008) in winning the prestigious award. She started 2012 with a runaway win and personal best of 1:08:48 in the Kagawa Marugame Half Marathon but that was just a warm-up for a decisive 5-minute victory in Rotterdam, where she became the fifth woman ever to break 2:19 for the Marathon. The following week Mary Keitany won the London Marathon in the only faster time posted during the year, but when both went to London for the Olympic Games Marathon it was Gelana who triumphed. Despite an early fall she stayed in the ever dwindling group until, with 4km left, she made a strong push for the finish, persisting even when it seemed it was to no effect. Only in the final kilometre did she start to edge ahead of her three remaining rivals, crossing the line in a new Olympic record of 2:23:07. (left to right): President Emeritus of AIMS Hiroaki Chosa, Tiki Gelana and Vice President of the Japanese Athletics Federation Dr Keisuke Sawaki. The AIMS/ASICS World Athlete of the Year Awards were founded in 1992 and are decided each year from nominations made by the 350 member races of AIMS. Previous female winners include Liz McColgan (GBR), Uta Pippig (GER), Tegla Loroupe (KEN), Naoko Takahashi (JPN), Catherine Ndereba (KEN), Paula Radcliffe (GBR), Mizuki Noguchi (JPN), Lornah Kiplagat (NED), Constantina Dita (ROM) and Mary Keitany (KEN). 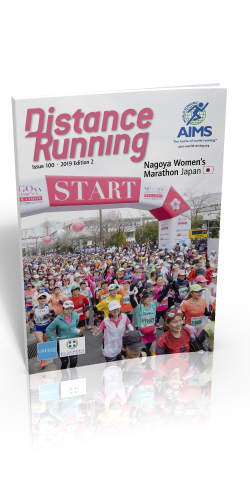 On 3 February Olympic Marathon Champion Tiki Gelana defended her title in the Kagawa-Marugame International Half Marathon (more) with a time of 1:08:53, kicking ahead of New Zealander Kim Smith in the last 600m to win by 7 seconds. In the men's race Australia's Collis Birmingham won by 100m from Enock Owamba and Isuyoshi Ugachi. In the Beppu-Oita Mainichi International Marathon (more) Yuki Kawauchi posted a personal best of 2:08:15 to win a ding-dong battle with rival Kentaro Nakamoto. In the Osaka Marathon (more) on 27 January Tatiana Gamera relentlessly closed on leader Kayoko Fukushi in the closing stages and passed her with 900m to run to win by 100m. The Khon Kaen Marathon (more) was held in the north of Thailand and the 23rd edition of the Marrakesh Marathon and Half (more) was run in Morocco. On 20 January the Kinmen Marathon (more) was run in Chinese Taipei. In the Standard Chartered Mumbai Marathon (more) in India Marathon debutant Jackson Kiprop broke the course record with 2:09:32 and Valentine Kipketer did likewise in the women's event, running a world-leading 2:24:33. The Santa Pola Int'l Half Marathon (more) was held in Spain and the Corrida de Sao Sebastiao (10km) (more) in Brazil. The Marathon Bahamas and Half (more) took place in Nassau, the Maraton de Culiacan in Mexico and the Maui Oceanfront Marathon (more) in the Hawaiian Islands. On 18 January the Egyptian Marathon (more) was run in Luxor, starting and finishing in front of Queen Hatshepsut's tomb and passing by the Valley of the Kings. The Gammon China Coast Marathon and Half Marathon (more) took place in Hong Kong on 13 January. On 10 January, in the Tiberias Winner Marathon (more) in Israel, Dominic Ondoro ran 2:08:00 and led three other runners under 2:09. Ahetu Bekere Dido won the women's race in 2:40:22. In the 11th Xiamen Int'l Marathon on 5 January (more) Negari Terfa broke clear of Marathon debutant Paul Lonyangat in the final 2km to set a new course record of 2:07:32. Fatuma Sado won the women's race in 2:27:35, breaking clear after 28km. The Mizuno Hong Kong Half Marathon Championships (more) took place on 6 January. On 7 January the Siberian Ice Half Marathon (more), unofficially billed as the coldest race in the world, was run in the city of Omsk.